This is a sweet woodland print. Arrived in a timely manner and is as it appears on the website. Appeared to be high quality, nice crisp cotton. Delight your toddler with the Woodland Toile Collection creatures on this fitted crib sheet. Created by Sweet Jojo Designs, this versatile sheet easily fits all standard baby and toddler mattresses. Dimensions 52 in. x 28 in. x 8 in. 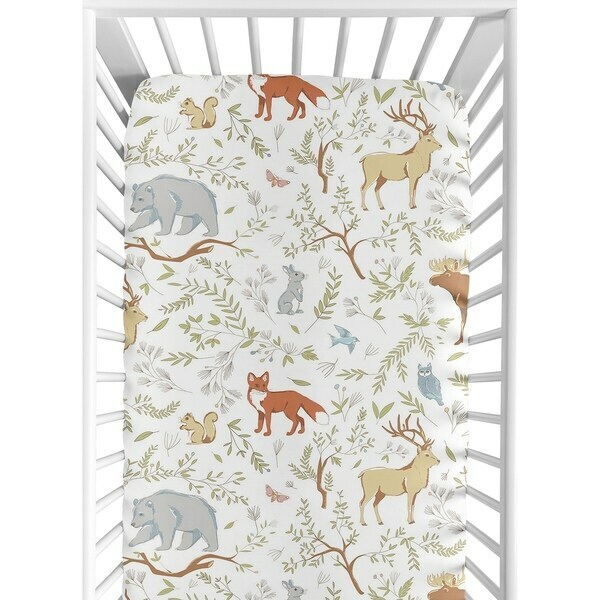 This cribsheet is soft cotton fitef sheet with woodland animals printed on it. My grandchildren love these sheets! Love the natural wildlife designs in subtle colors. Nice fit and very soft micro fiber cloth fitted crib sheets. Great price so stocked up the nursery! Very cute crib sheet with little animals on it. Fits perfectly and washes well. My daughter really likes it with the other animal print decor in the baby's room. I love this sheet. It is adorable. Good quality and color. It looks perfect it our rustic themed nursery. I would definitely purchase again. Nice quality sheets for babies. Soft. Cutest thing ever! Thank you so much.